About two and a half years ago Mr B and I went to the Yves Saint Laurent Style is Eternal exhibition at the Bowes Museum - an extra special treat as we went to a Durham University Alumni event involving an interesting talk about how the exhibition came to the Bowes Museum and free wine (most of the pictures I took are therefore a little blurry). I decided rather than buy a souvenir I would buy a Yves Saint Laurent Vogue pattern instead and sew that up. I found the pattern and fabric quite quickly but for some reason actually getting started took another two years. 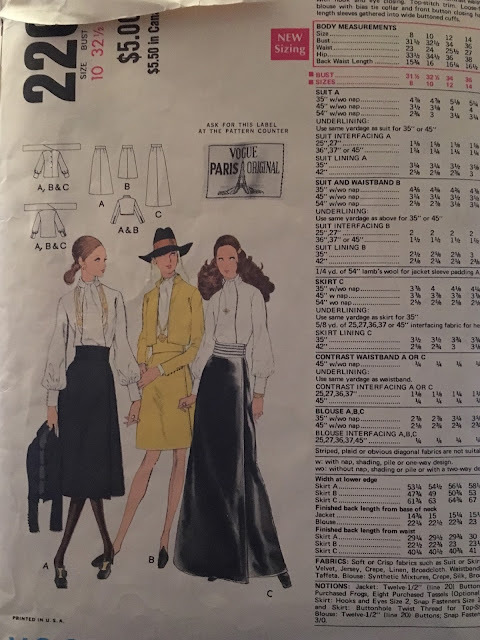 It turned out that my Mother owned the pattern I chose back in the 1970s but had never made it (she also got rid of all her old patterns and regrets it severely). She could remember the features in amazing detail and its been great discussing progress with her each week. I dispensed with making a muslin as I think that would have prolonged the project even further (in hindsight there are a couple of alterations that I should have made but I'm still happy with the outcome) and dived right in. 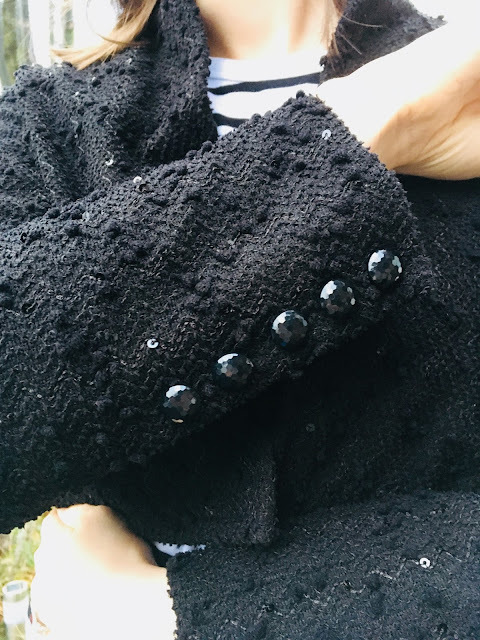 My fabric, a black boucle with sequins, was quite stretchy and the pattern said to underline so I did so with black polycotton which was cheap, lightweight and stable. I didn't interface as much as the pattern suggested as my Mother said that 1960s/70s jackets were designed to be much more structured than I might like. I interfaced the upper back and front edges only with a lightweight sew-in interfacing and it seems to be fine. I didn't want to put the frogging on the front as I wasn't planning on doing it up and didn't think I'd be able to find any nice frogging easily. Where do you even buy frogging? My original plan was to use topstitching thread for the topstitching and machine the buttonholes but my machine wasn't having any of this so I used normal thread for the topstitching and didn't bother with buttonholes. I've never hand sewn a buttonhole and think that having to do ten at a first attempt might not have been the wisest choice. 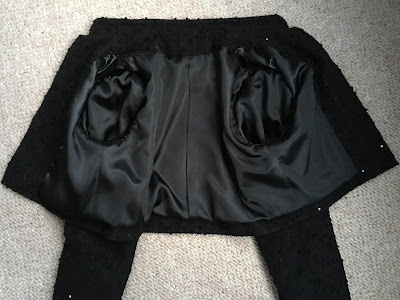 I decided to spend twenty minutes each day when I got home from work sewing which worked really well for something like this where there are lots of small steps, I was amazed at how much could actually be achieved in such a small amount of time. The instructions were a joy and have resulted in a really professional looking and feeling garment - the pleat in the lining is particularly pleasing me for some reason. I'm looking out for another jacket to try now as I really enjoyed my attempt at tailoring. The body and sleeves could maybe have been a bit longer and the shoulders a little narrower but its fine as it is and really useful for wearing to parties (I rarely go to parties). This post has been quite long, which is what you get for not writing up as you go along. If anyone has any questions about any of the details just ask!